“Ride Lonesome” is the fifth film in the great Budd Boetticher/Randolph Scott saga. Boetticher crafts this story on a grander scale than his previous four films, a classic tale of revenge with specific plot points and imagery which would directly influence Sergio Leone. Randolph plays a tough bounty hunter Ben Brigade who picks up wanted criminal Billy John (James Best) to take back to Santa Cruz. Along the way while stopped at a staging post he encounters Carrie Lane (Karen Steele) a woman left by her husband to fend off an Indian attack. When she realizes he must be dead Ben brings Carrie along to save her from certain death at the hands of her enemies. The trio then meet up with a nefarious duo Sam and Whit (Pernell Roberts and James Coburn) who form an oddball group of shifty outlaws. In between persistent Indian attacks, like an episode of ‘Survivor’, the individuals tempt and tease each for alliances. Billy tries to convince the not-so-smart Whit to set him free. Sam conspires to get rid of Ben and take the bounty for himself. As for Ben, his true intentions are kept secret - a desperate but focused mission of revenge. Karen Steele’s character Carrie would seem to be lost in the plotting. An extraneous element designed to get a pretty face on the screen perhaps? Carrie purpose is deeper than mere plot. As a woman, her presence causes much restlessness among the hombres. While the men speak in chauvinistic bravado there’s a fear and misunderstanding of her which puts them all on edge. Carrie exudes such power over the undersexed men, it’s both dominant and dangerous. Randolph Scott’s character is the classic Western loner – hence the title. A broken man whose wife died and whose sole purpose is a focused desire for revenge. Scott’s journey mirrors Charles Bronson’s ‘Harmonic Man’ character in Leone’s “Once Upon a Time in the West’. The final climatic moments which reveal his elaborate plan is a direct influence on that film. In fact, as Leone and his co-writers (including Dario Argento and Bernardo Bertolucci!) were crafting their story, they specifically watched quintessential Westerns to inspire them. Clearly the Boetticher films and specifically “Ride Lonesome” were on their list. “Ride Lonesome” is perhaps Boetticher’s most beautiful film visually. For the first time he used a Cinemascope process, the effect of which is a crisp wide angle frame which further isolates his archetypical lonesome characters against the environment. But it’s the final shot which is the resonating imagery of the film. After the climax Boetticher cuts away from Brigade to wrap up the other characters. 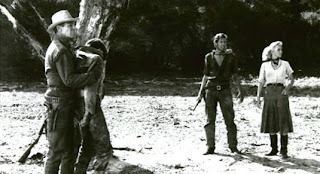 We don’t know what happened to Brigade until we cut back to the scene of the final shootout showing Brigade standing in front of the burning ‘hanging tree’ – an awe inspiring image and arguably one of the great ‘closing shots’ in film history. Enjoy.